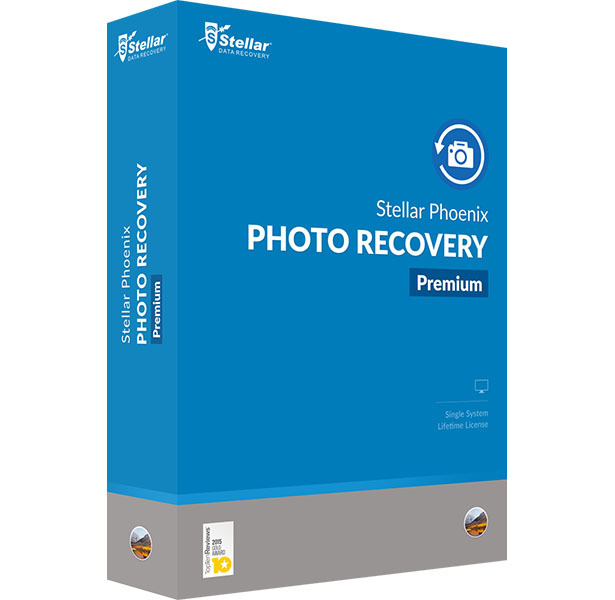 Stellar Phoenix Photo Recovery 8 Premium is reliable and comprehensive software that completely recovers all your lost/deleted multimedia files (pictures, audios, videos, etc.) from most photo loss situations. The Premium version includes a special module to repair corrupt or distorted photos (having JPG or JPEG extension), videos and restores it to its original format. 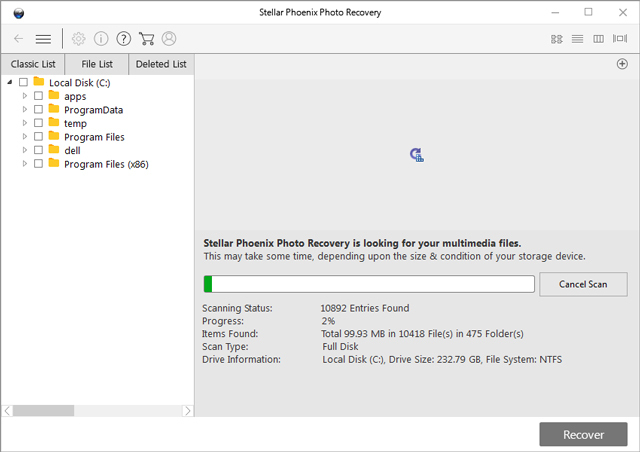 The Stellar Phoenix Photo Recovery tool facilitates photo recovery from digital cameras, memory cards, SD cards, USB Sticks/Flash drive, external and internal hard drives. 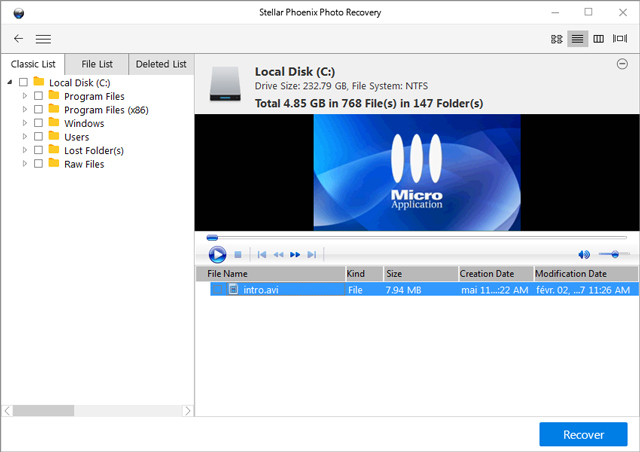 With improved support for FAT32, ExFAT and NTFS file systems, the software allows recovery process to be initiated for a logical drive, physical disk, attached external storage media, or a saved image file. The software makes sure that it is all you need to recover any kind of lost or deleted photos. 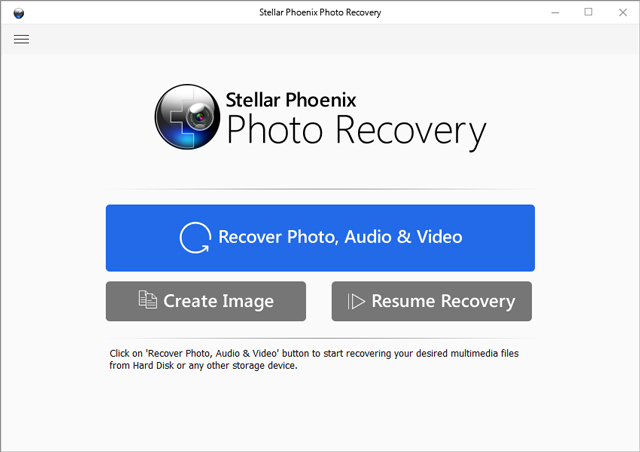 Stellar Phoenix Photo Recovery is also capable of recovering different video and audio file formats stored on hard drives, memory cards, and other storage media. It is skilled in recovering video files like AVI, ASF, F4V, WMV, MP4, MOV etc as well as audio files like RPS, OGG, MP3, WMA and many more. It also facilitates to see the preview of recovered video as well as audio files and save them at a desired location. 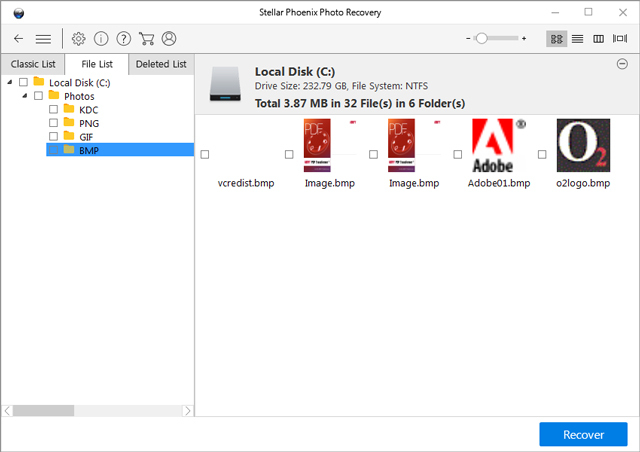 The image recovery software from Stellar Phoenix lets you save the directory tree structure generated after a drive / volume scan to a desired location on the disk. The information is saved as a file that can be used to regenerate the tree structure of found files / folders or to resume recovery at a later stage. You can choose to save the result of the complete procedure or stop the scan at any time and save the information up to that point. 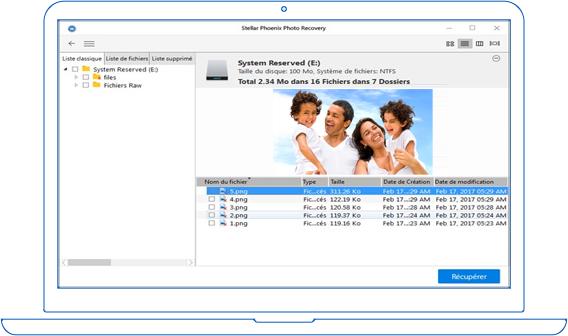 Digital photo recovery software allows you to scan only a desired region of the hard drive or volume. 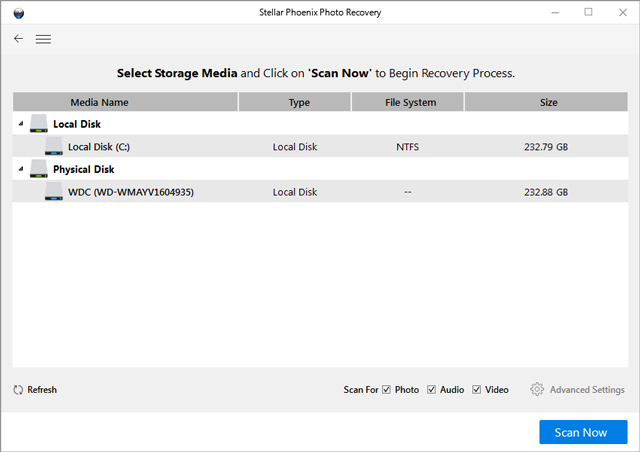 Media files found in that region are provided for preview and recovery. It also enables to scan media only for desired file types. This option is useful in case you know exactly where a lost photo/picture or file resided before it was deleted or what its file type was. 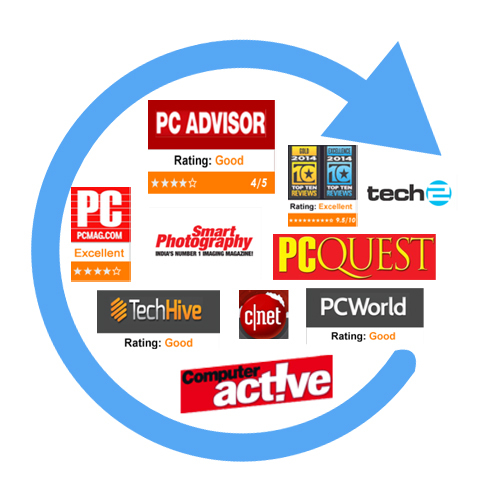 With time and continuous usage, internal and external drives/media develop bad sectors. This kind of damage often makes data stored on the device inaccessible. 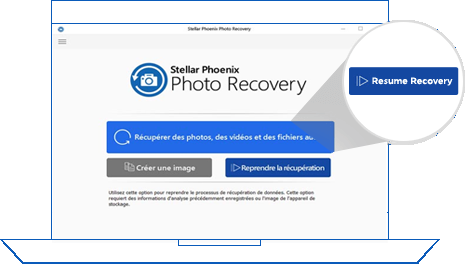 With the Stellar Phoenix photo recovery software, you can create a sector-by-sector image of the entire or a selected range of media so that the data stored on the remaining good sectors can be saved. This image can then be used to recover data through the software. With the launch of a new version of the software, three preview types have been added for you to view deleted / lost files and folders before recovering them. Classic List lists the files / folders as they are found on the hard disk, File List lists files / folders as per media type (for example, document, audio, video, archive, etc.) and Deleted List lets you see the list of deleted files. The product supports RAW recovery of files in case the usual recovery procedure does not yield satisfactory results. 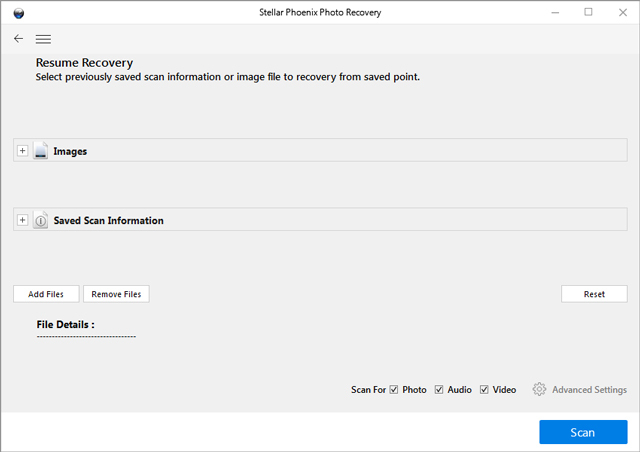 RAW recovery works on the principle of file signature recognition and conducts a deeper scan to retrieve lost / deleted files. 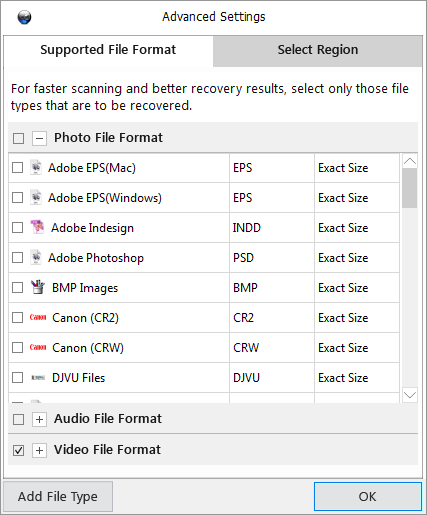 Improved scanning engine ensure your files and folders are found out quickly thus enabling the digital photo recovery software to restore all data accurately. JPEG Repair is reliable utility to repair damaged or corrupt image files having JPEG or JPG file extension. The software repairs image files saved on hard disk of computer, memory card, or any other storage media. This tool scans the storage media thoroughly and repairs even the severely corrupt JPEG image files without modifying the original data of the JPEG image file. Video Repair fixes all your Video files created in different formats which get lost due to header corruption, memory card error, file transfer error, improper system shutdown. Camera Formats : Nikon (NEF, NRW), Canon (CR2, CRW), Olympus (ORF), Sony (SR2, ARW, SRF), Kodak (K25, KDC, DCR), Fuji (RAF), Minolta (MRW), Pentax (PEF), Sigma (X3f), Epson (ERF), DNG, Panasonic (RAW), Mamiya (MEF), Leaf (MOS), DJVU, PGM, TGA, Adobe EPS (Mac). Video Formats : AVI, WMV & ASF, MP4, M4V, 3GP, MOV, MPEG, DV, 3G2, M4B, AVCHD Video File (MTS), Divx Encoded Movie File (DIVX), Matroska Video File (MKV), MOI Video File, OIGG Media Player (OGM), Video Object File (VOB), 3G2, ASX, AJP, F4V, VID, TOD, HDMOV, MQV, SVI, MXF Movies. Audio Formats : WAV, MP3, AIFF, RPS, MIDI, M4A, M4P, AU, OGG, WMA, RM, Real Audio (RA), ACD, AMR, AT3, CAFF, DSS, IFF, M4R, NRA, SND. Image Formats : JPEG, JPG, TIFF, PNG, GIF, BMP, JP2, INDD, PSD, Pain Shop Pro Image File (PSP), Mamiya (MOS), Picture File (PCT).